Hockey Blog In Canada: A New Euro League? In today's hockey world where players change teams and leagues as often as they change their underwear, it was shocking when the Russian billionaires gathered together to form a new Russian league that was built on the previous Russian SuperLeague's founding. To this day, the KHL is still evolving and changing as time progresses, but they're holding strong as time marches on. Of course, there's the Swedish Elite League, the Finnish Liiga, the Danish Metal Liagen, the Deutsche Eishockey Liga, and the Czech Extraliga, but there's a vast section of eastern Europe that seems to be underrepresented when it comes to their hockey elite. An announcement today may change that. I was scanning Twitter when one of the best accounts on that social media platform concerning eastern European and Russian hockey had posted a rather interesting tweet. While it seems this is in the very early stages of even being a remote possibility, the fact that Belarus, Latvia, Lithuania, Estonia, Ukraine, and Poland are discussing their own league is an exciting possibility when it comes to strengthening hockey in those nations and on the international stage. Remember how I stated a few days ago about how upsets of the hockey superpowers at international tournaments breeds hope and promise in the underdog nations? While I can't say this is directly related to that premise, this creation of a new European league will certainly help these six nations foster growth and interest in hockey within their borders. Belarus is a rather interesting country to be speaking with the other five countries after the KHL had passed a ruling that turned Belorussian-born players from being considered as foreign players to no longer falling under the foreign player rule. With Dinamo Minsk playing as part of the KHL, they would be able to sign more foreign-born players without having to worry about their Belorussian players any longer. This seems that it would benefit the Minsk-based KHL team in a big way as well as promoting other KHL teams to consider Belorussian players. However, the damage may already have been done. In ten KHL seasons, Dinamo Minsk has missed the KHL Gagarin Cup Playoffs six times and are on pace to miss for a seventh time in eleven seasons this year. In the four years they did qualify, they lost in the quarterfinal series each time, winning just five games in those four appearances. Needless to say, having Minsk possibly be one of the founding clubs in this new eastern European league would provide the league with immediate credibility if Dinamo Minsk was considering this option. Latvia is the other interesting case as they too have a KHL team currently playing. Dinamo Riga is currently in ninth-place in the KHL's Western Conference, 14 points ahead of tenth-place Minsk. They're tied with eighth-place Vityaz in points, but sit lower due to having less wins, and are currently three-points behind seventh-place HC Sochi. They're in the hunt for a playoff spot, but they're right on the edge of missing the playoffs again. I say "again" because Riga hasn't been to the playoffs in four seasons, and has only made the playoffs in five of their ten seasons of play in the KHL. In those five appearances, they've advanced to the conference semifinals twice, so comparatively to the Minsk team they've had more success, but it seems the Latvian team may be in for the same fate as the Belorussian squad this season in missing the playoffs again. Adding a second KHL team, if Dinamo Riga was approached, would mean there were two already-established teams that could provide legitimacy and competition in this newly-formed league. Riga and Minsk would also be instant competition for one another so there wasn't one "superteam" that dominated the rest of the league. Granted, there would be two potential "superteams", but I'd assume that there would be a handful of players from each team that may jump to another KHL team to remain at that level of play. The interesting thing about this league is that there may be more KHL teams who would follow these two teams out if they chose to join this new league. HC Slovan located in Bratislava, Slovakia has struggled for years in the KHL both with wins on the ice and financially, and this could be a league they may want to jump to if they want to cut costs while remaining in a competitive league. Since jumping to the KHL six seasons ago, they've qualified for the playoffs only twice and were swept in the quarterfinals on both occasions. In their seventh season this year, they are dead last in the Western Conference, 17 points back of Vityaz, and will certainly miss the playoffs for the third straight year. Of course, this is all just speculation in how this new league could get up off the ground with some legitimacy. As of right now, there are simply discussions in trying to get this off the ground, so I prefer a more broad scope when looking at this possibility. Belarus and Latvia are often also-rans at international tournaments. They've produced a handful of notable players - the Kostisyn brothers for Belarus and Sandis Ozolinsh for Latvia, for example - but they have yet to show enough talent to remain on the international stage for any sustained period of time. They appear and re-reappear at the World Junior Championship, they show up at the World Championships, and rise to the occasion for the Olympics occasionally, but they aren't a perennial attendee at any of those tournaments. Poland and Ukraine make even fewer appearances while Estonia and Lithuania have never played at the IIHF top tournaments in their histories. Introducing a league into this area of the world among these six countries will do for them what the Swiss League has done for Swiss hockey and the DEL has done for Germany and the Metal Ligaen has done for Denmark. All of those countries make more appearances at the highest level of IIHF competitions in today's game thanks to their investment in and building of their national leagues. 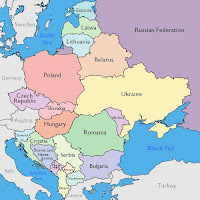 The correlation is clearly there as the Swiss, Germans, and Danes continually get better every time we see them, and this can and should happen in all of Belarus, Latvia, Lithuania, Estonia, Ukraine, and Poland if they can get this league off the ground. Again, it won't happen overnight. We might be talking about decades before a country like Latvia, who may be the furthest ahead in their development currently, becomes a fixture at IIHF top-level tournaments. Getting a country like Estonia or Lithuania to even one top-level tournament will be a testament to the effort and work that went into this league, but it also serves to prove that starting high-level hockey leagues in these developing countries works. I'm hopeful the powers-that-be in these discussions from these six countries can find a way to make this happen. This is an exciting development when it comes to making the game stronger across the planet, and I want to see this league take flight. I'm hopeful they won't rush to put a product on the ice just to say "we did it! ", but I am hopeful that with smart planning, a clear vision of where they want to go, and some solid initial investment that this new proposed league can elevate the players in those countries to new hopes and dreams that include beating Russia and Canada on the international stage.